Repton Infinity was the fourth game in the Repton series, and was a fascinating departure from previous games – it included its own programming language. This meant that instead of the usual collect diamonds/avoid boulders/kill monsters formula, you could create any number of games with it, with an in-built language called REPTOL. (I had great fun creating the odd utterly lousy and half-arsed game myself.) The only real fault with the system was that even at the time, it felt slightly slow; the language strained at the limits of the machine. Man 1: My dog’s got no nose. Man 1: When it’s ajar. …maybe I have problems. Actually, I know I have problems, because I get every single joke in the fake address they give out. Sigh. More interesting, perhaps, is the idea of the code zipping around the country at 1200 baud. (Ironically, all the best stuff is in the section they call the “boring bit”.) But at the time, of course, it was just great to feel part of something secret. Even if the only way I found out about it was through a news stand magazine, rather than hacking the code like someone cool. 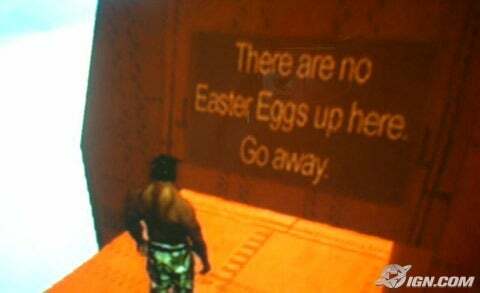 So, there we are – one of my favourite hidden eggs of all time. I’ll leave you with a question: whilst I know about the cheat mode mentioned – moving around your character whilst on the map screen – I have no idea about the other hidden messages in the game. Anyone out there know anything about them? Hey, I had no idea that Repton Infinity was written by the *INFO guys! Quite a few Spectrum titles had whole extra games as Easter Eggs. ‘Booty’ had one, as did the 128K version of ‘Zub’. I did enjoy “press reveal for answers”. I also owned a copy of Repton Infinity at the time, though it was only on the Electron, which was woefully underpowered for such a grandiose title. And I’d asked for it as a main Christmas present, too. And yeah, Phil – Dave Lawrence and Dave Acton. Despite the slight slowness, it was an amazing piece of work for the time. Problem is, as with all Repton games, I was utterly useless at it – I barely got off the first screen of any of the levels.